When we left off in the last issue we were having lunch at the campground in Causapacal. The girls hiked the section north from the campground after lunch and were not very happy when they returned. It seems that the farmer whose hayfield the trail goes through had spread cow manure on the field the day before. It was the liquid kind and was spread all over. They were not "happy hikers". The only "good" thing about the day was that there was an unexpected stream crossing that they had to wade thru. The bad thing was that Judy and Darcy had on new shoes that they were breaking in. The hike the next day was along a salmon river that was very picturesque, but slow going. Beth took the day off to rest her ankle. We met Darcy and Judy at the salmon barrier where they had lunch at the warden's cabin. We moved to Amqui, QC on July 30th. The campground there is more of a resort with a pool, marina, and 'Le tours de poney'. That's pony rides in English. That evening I drove 45 miles to the Mt Joli airport to meet Jerry Groebe who was arriving from Michigan. After waiting for an hour I watched as the one worker went outside to greet the plane. At the exact time of arrival he watched the sky (it was foggy), but no plane. After a few minutes he came back inside and they made an announcement in French. I went to the counter and asked what was going on and was told that it was too foggy for the plane to land and that it was going on to Gaspe. I said that the person I was to meet would not be able to contact me so they gave me the phone number of the airport there. The airport at Gaspe told me that he would be put in a motel and would be on a plane to arrive at 7:30 the next morning. That day I dropped the girls off in the rain and went back to Mt Joli. I arrived at 9:00 but the airport was empty. I asked at the counter again and was told that it was too foggy in Gaspe for the plane to land and that Jerry was in a taxi that would arrive at 1:00 in the afternoon. Since the girls would be expecting me to pick them up at that time, I couldn't wait. I drove back to Amqui and tried to find them. We had bought a pair of 2-way radios a couple of weeks ago and so I paged them as I drove up and down roads they were close to. When I found them they were on a road that was not where the trail was. I backtracked in the car to where the trail was supposed to turn into a field, but there was no sign or blaze. I passed a farm where a young boy was just leaving in his car. He didn't speak much English but with a couple of badly pronounced French words from me and pointing to the map, he indicated he would show me where it was. He drove to the spot I thought the trail was and walked into the weeds and pointed to a hole in the ground where the sign used to be. I went and got the girls and drove them to the spot. They dug around in the bushes and found the sign. They placed it so that it could be seen and continued on their way. I then drove back to Mt Joli to try the third time to pick up Jerry. He wasn't there when I arrived but the taxi pulled up a few minutes later. He said it had been an exciting 4.5 hour ride. The driver kept falling asleep and Jerry had to wake him up several times when he drifted into the on-coming traffic. We found the girls just after they had started thru a field. They turned around and came back to meet us. The next day they all started out from that point and finished just North of Amqui. The camping site now had 3 tents and every night had a planning session to prepare for the next day. It seems like it rains every day. You can see the great pumpkin walking down the road in this picture. The wet weather helps to maintain a healthy mosquito and black-fly population. We moved the RV to Matane Wildlife Reserve on 8/2. The campground here is very different from Amqui. The only other people staying there are salmon fisherman. The closest civilization is a small motel about 3 miles away. The closest store 10 miles. We will stay here for 10 days. They rent chalets here mostly to fishermen and hunters. The a-frame next to the cabin in the picture looks like something used to change engines in cars, but is for dressing moose. We have seen a few moose but no pictures yet. In order to insure that Beth would be able to catch her train, the girls decided to skip ahead a few days and do a section where they had to stay overnight 3 nights. Jerry didn't go because of a very steep decent down a mountain on the last day. The next day Jerry and I drove to the next town to scout out campgrounds and drove back by way of where we would pick up the girls when they came out. On the gravel road between St. Ann and the trailhead (23 miles) we saw 2 hikers hitching a ride. It was a man trailnamed "Mountain Dancer" and his son. They had walked to town for food and were returning to where we we going. They had started at Gaspe and were planning on going to the Canadian border. When we got to the trailhead, Jerry saw the mountain and decided that he had made the right decision in not hiking. The trail goes off and down to the left. It took Chuck Wilson 2 hours to get down when he hiked in 2000. The girls stayed at tent platforms on 2 nights and one night on the top of Mt Blanc in a refuge. We would call it a cabin. Their last day out it poured down rain and was cold and windy. It took them 9 hours to get down the mountain and they thought they were going to get hypo-thermia. They had fallen in the mud many times. Darcy had sprained her wrist and Beth her ankle. The were very glad to get in the warm car for the one hour ride back and then a warm shower. We drove to Amqui and had dinner out. Beth and Darcy spent the night in the meeting room for the campground because their tents and sleeping bags were wet. The next day was spent drying things out and driving to Matane to the nearest laundromat. Since Beth and Darcy have not gotten a picture of a moose both of them got their picture with a moose. The next day it was back on the trail to complete the missed sections. Everyone started but Beth twisted her ankle and fell and twisted her knee also. They radioed me. I had walked a couple of miles toward them and had to walk back to the campground, get the car and pick her up at a road crossing. The others hiked on back to the campground. The next day she didn't hike but rested her knee and got everything ready for her trip back to Florida. 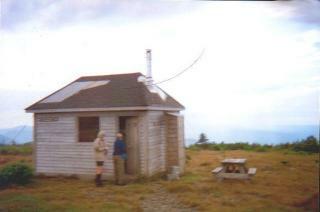 After dropping off the other's to hike Beth and I drove to Matane, QC to get Judy's film developed. We saw 2 hitch-hikers along the road and recognized them as "Mountain Dancer" and his son, now called "Rock Man". (He likes to collect rocks and carries them in his pack.) The son had hurt his ankle and they decided to return home in Quebec City. We drove them to the bus station and then continued on our errands. That evening we all went to Amqui to dinner and dropped Beth off at the train station. Before she left however she passed her food storage box on to Jerry. We left Beth crying at the station and returned to the campground. 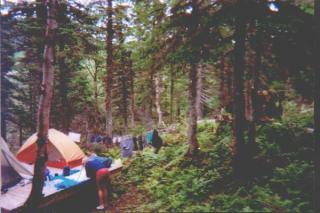 On 8/12 we will be Moving the RV to Saint Ann de Mont and continue hiking in Parc de la Gaspesie. P. S. Darcy says to tell Garth she misses him. Make sure to click here to get the latest position.